Life is movement. Before speaking, we moved. Before painting and sculpting we danced. Cultures of the world have given dance ritual status before any other form of expression. 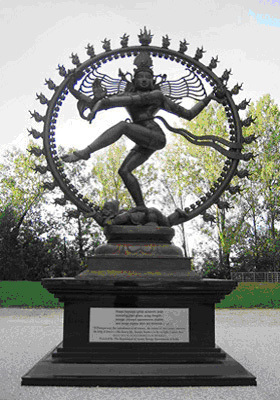 In 2004, a new landmark was unveiled at CERN, the European Center for Research in Particle Physics in Geneva – a 2m tall statue of the Indian deity Shiva Nataraja, the Lord of Dance. Shiva’s dance symbolizes the cosmic cycles of creation and destruction, and the daily rhythm of birth and death. The dance represents the five principle manifestations of eternal energy – creation, destruction, preservation, salvation, and illusion. move·ment \ˈmüv-mənt\ n. 1a. The act or an instance of moving; a change in place or position. 1b. A particular manner of moving. 2. The rhythmical or metrical structure of a poetic composition. Movement is more than mere physical exercise. It can increase awareness on all levels: the physical, the mental, and the spiritual. Movement integrates the mind and body. Dance affirms the sensual nature of our physical being, and treats it as fundamental to spiritual awareness. Sufi saints whirl in spiritual ecstasy. Movement surrounds us day and night. The sun, moon and stars cross the sky in a complex, celestial dance. Trees and flowers sway in the breeze. Birds and pollen ride the air. Water flows through all living things bringing nutrients and taking away waste. We embody movement. A few years ago we didn’t exist, all our atoms have been replaced in the interval. Here today, gone tomorrow, renewed down to the last atom, we endure only in shape, pattern and form, as a genetic blueprint. Our body extends into space. Elements, such as the phosphorus in our bones, were formed at an early stage in the evolution of our galaxy. Like many elements in the earth’s crust, phosphorous cycled through the lifetime of several stars before appearing on earth and finding its way into our body. The earth and stars move through us. Air moves in and out of our lungs exchanging oxygen for carbon dioxide. Breathing is essential to life. Breathing and movement produce vitality – a fluidity of movement. Breathing into our body – moving our breath through the torso up into the neck and head, and down into the pelvis and legs. The spine expands, the sacrum lifts, the shoulders move down the back and the head floats. In moving and breathing we find moments of loving and sharing. We dance with delicious grace. There is a wholeness and unity within us – our body, mind and spirit are in synchronization, in special harmony. Steve Paxton; Fall After Newton. Video documenting the development of contact improvisation from 1972 to 1983. We move in response to inner feelings and outside forces. Energy stored is released, muscles tense and relax – pushing and pulling. The physicist would say that, “motion is the continuous displacement of an object within a spatial frame of reference.” In objective terms motion or movement is determined by its direction and speed. However, in subjective terms, physical movement is harder to pin down. Observed movement becomes a sequence of images stimulating the retina. These images become electrical impulses that move through the optic nerve to the brain. The brain interprets these stimuli based on its accumulated experience – on what it ‘knows.’ Motion is perceived as the aggregate difference between successive images. Movement is predicted based on this calculation. We distinguish the basic movements, translation and rotation, in combination and within three-dimensional space. We can follow several moving objects at once. We can map these basic movements to the body and recognize complex movements and gestures. In turn these movements or gestures trigger feelings in the observer. Kinesthics, or more obscurely proprioception, is the ability to sense the position and location and orientation and movement of the body and its parts, body-awareness. Coupled with movement, this self-sense becomes a means of communication. Movement communicates; movement is the first ‘natural’ universal language.